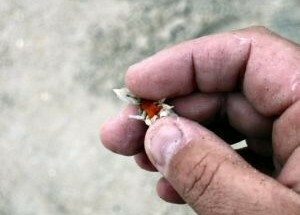 San Diego is known for its beautiful beaches - but many don't realize how good the fishing can be within the waves. The surf zone is actually offers quite a variety of fishing opportunities. 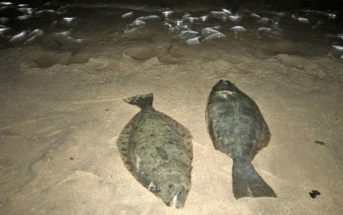 The shallowest zone - which you don't even need to get your feet wet to fish - is home to corbina, surf perch, croaker and smaller shovelnose guitarfish. Out a little deeper, but still within casting distance from the beach are leopard sharks, bat rays, halibut, and bigger shovelnose guitarfish. 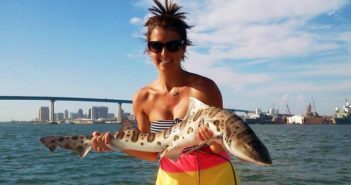 And beyond that, out of reach of most anglers standing or wading in the surf are bigger shark species (mako sharks, blue sharks, and thresher sharks), barracuda, bonito, and even the occasional yellowtail or white seabass. 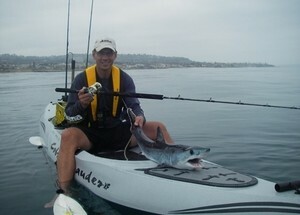 That zone is best fished from a kayak or from one of the many public fishing piers along the coastline. 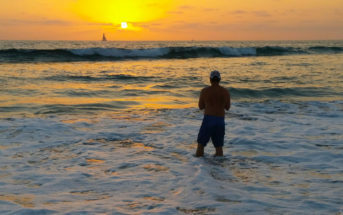 Check out our Surf Fishing Spots page for locations of the popular surf fishing beaches, fishing piers, and the Marine Protected Areas and Reserves which are closed to fishing or have special regulations. A list of the most bite friendly fishing locations in one of America’s best fishing cities.